What is Cost of Debt? The cost of debt is the return that a company provides to its debtholders and creditors. These capital providers need to be compensated for any risk exposure that comes with lending to a company. Since observable interest ratesSimple InterestSimple interest formula, definition and example. Simple interest is a calculation of interest that doesn't take into account the effect of compounding. In many cases, interest compounds with each designated period of a loan, but in the case of simple interest, it does not. play a big role in quantifying the cost of debt, it is relatively more straightforward to calculate the cost of debt than the cost of equity. Not only does cost of debt, as a rate, reflect the default risk of a company, it also reflects the level of interest rates in the market. In addition, it is an integral part of calculating a company’s Weighted Average Cost of Capital or WACCWACCWACC is a firm’s Weighted Average Cost of Capital and represents its blended cost of capital including equity and debt. The WACC formula is = (E/V x Re) + ((D/V x Rd) x (1-T)). This guide will provide an overview of what it is, why its used, how to calculate it, and also provides a downloadable WACC calculator. There are two common ways of estimating the cost of debt. The first approach is to look at the current yield to maturity or YTM of a company’s debt. If a company is public, it can have observable debt in the market. An example would be a straight bondFixed Income TradingFixed income trading involves investing in bonds or other debt security instruments. 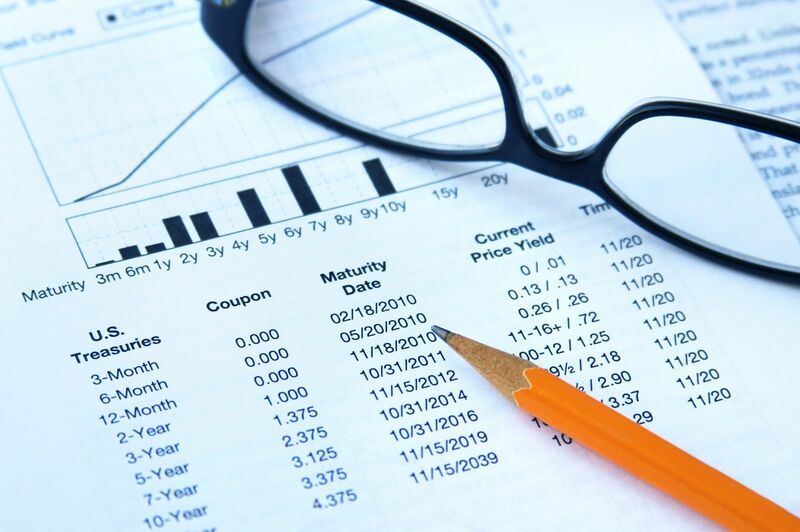 Fixed income securities have several unique attributes and factors that affect their price and value. Fixed income investing is favored by investors who prefer low-risk investments with a guaranteed return. that makes regular interests payments and pays back the principal at maturity. This approach is widely used when the company being analyzed has a simple capital structure, where it does not have multiple tranches of debt, including subordinated debt or senior debt for example, with each having significantly different interest rates. The other approach is to look at the credit rating of the firm found from credit rating agencies like S&P, Moody’s, and Fitch. A yield spread over US treasuries can be determined based on that given rating. 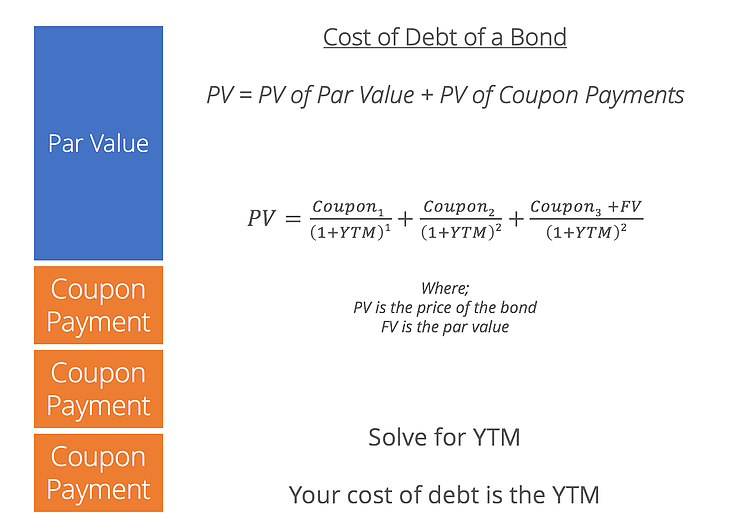 That yield spread can then be added to the risk-free rate to find the cost of debt of the company. This approach is particularly useful for private companies that don’t have a directly observable cost of debt in the market. Simply put, a company with no current market data will have to look at its current or implied credit rating and comparable debts to estimate its cost of debt. When comparing, the capital structure of the company should be in line with its peers. When neither the YTM nor the debt-rating approach works, the analyst can estimate a rating for the company. This happens in situations where the company doesn’t have a bond or credit rating, or where it has multiple ratings. We would look at the leverage ratios Leverage RatiosA leverage ratio indicates the level of debt incurred by a business entity against several other accounts in its balance sheet, income statement, or cash flow statement. Leverage ratios include debt/equity, debt/capital, debt/assets, debt/EBITDA, and interest coverage. This guide has exmaples and Excel templateof the company, in particular, its interest coverage ratio. A higher number for this ratio means a safer borrower. The yield spread can then be estimated from that rating. When obtaining external financing, the issuance of debt is usually considered to be a cheaper source of financing than the issuance of equity. One reason is that debt, such as a corporate bond, has fixed interest payments. In equity financing, however, there are claims on earningsNet IncomeNet Income is a key line item, not only in the income statement, but in all three core financial statements. While it is arrived at through the income statement, the net profit is also used in both the balance sheet and the cash flow statement.. The larger the ownership stake of a shareholder in the business, the greater he or she participates in the potential upside of those earnings. Another reason is the tax benefitTax ShieldA Tax Shield is an allowable deduction from taxable income that results in a reduction of taxes owed. The value of these shields depends on the effective tax rate for the corporation or individual. Common expenses that are deductible include depreciation, amortization, mortgage payments and interest expense of interest expenseInterest ExpenseInterest expense arises out of a company that finances through debt or capital leases. Interest is found in the income statement, but can also be calculated through the debt schedule. The schedule should outline all the major pieces of debt a company has on its balance sheet, and calculate interest by multiplying the. The income tax paid by a business will be lower because the interest component of debt will be deducted from taxable incomeEarnings Before Tax (EBT)Earnings Before Tax (EBT), is found by deducting all relevant operating expenses and interest expense from sales revenue. Earnings Before Tax is used for analyzing the profitability of a company without the impact of its tax regime. This makes companies in different states or countries more comparable, whereas the dividends received by equity holders are not tax deductible. The marginal tax rate is used when calculating the after-tax rate. Enterprise ValueEnterprise ValueEnterprise Value, or Firm Value, is the entire value of a firm equal to its equity value, plus net debt, plus any minority interest, used in valuation. It looks at the entire market value rather than just the equity value, so all ownership interests and asset claims from both debt and equity are included.